TAMPA, Fla. -- Chlorothalonil, a common fungicide used around the world on farms and golf courses, has been found to be lethal to frog tadpoles at levels below what regulators have said are safe environmental concentrations, according to a University of South Florida study published in one of the nation’s leading environmental journals. In a study published in the journal Environmental Health Perspectives, USF biologists Taegan McMahon and Jason Rohr found that nearly every frog exposed to chlorothalonil in their study either died or suffered elevated stress hormone levels and changes in their immune cell counts, conditions which could weaken the animal and leave them vulnerable to parasites. The finding could offer insight to a worldwide investigation of factors that might be causing widespread declines of amphibians, a taxon which many scientists view as a harbinger of potentially dangerous environmental conditions for other living creatures. Chlorothalonil was known to suppress the immune systems of oysters and fish, but was relatively untested on amphibians before the USF study, conducted in conjunction with researchers from the University of Florida Gulf Coast Research and Education Center, Rowan University, and the Archbold Biological Station in Venus, Fla. Unlike chlorothalonil, most previously tested pesticides have not directly killed frogs at or below expected environmental concentrations. The expected environmental concentration of a pesticide is a concentration expected to be found in a water body that is a standardized distance from an application site, is calculated using U.S. Environmental Protection Agency (EPA) software, and is the concentration typically used by the US EPA to determine the safety of pesticides. Lab tests showed that, at the expected environmental concentration, the fungicide was lethal to nearly 100 percent of the tadpoles in all four amphibian species tested. Moreover, concentrations of chlorothalonil four orders of magnitude below the expected environmental concentration were associated with significant mortality in two of the four amphibian species. Outdoor field experiments generally matched the findings of the laboratory experiments, suggesting that these results might be relevant to effects in nature. The experiments also showed that the chemical was nonlinearly associated with mortality, stress hormones and immunity: low and high concentrations caused significantly greater mortality and stress hormone levels than intermediate concentrations and controls, a dose-response consistent with endocrine disruption. In addition, for the survivors of low-dose chlorothalonil exposure, chlorothalonil concentration was inversely correlated with the number of immune cells in their liver, suggesting potential immunosuppresion of the surviving frogs. Chlorothalonil is the most commonly used synthetic fungicide in the U.S., with some 14 million pounds being used predominantly on peanuts, strawberries, potatoes, tomatoes and turf grass. The fungicide is part of the same chemical family, organochlorines, as the pesticide DDT, which has been banned for decades but remains pervasive in the environment. The U.S. Environmental Protection Agency has strict standards on the application of chlorothalonil, which is known to contaminate surface waters through runoff and soil erosion. Users are warned to not spray the fungicide near water. However, it should be noted that the concentrations tested in these experiments were based on appropriate product use. The USF scientists are focusing their 2 1/2-year research project on the effects of chlorothalonil on freshwater organisms. Chlorothalonil binds to glutathione, disrupting cellular respiration that can lead to cell death. “Cellular respiration is an essential process for almost all living things,” said McMahon, a USF integrative biology Ph.D. student. The researchers cautioned that their study has yet to determine the mechanism by which the fungicide affects frogs, only that its use raises red flags because levels expected to be found in the environment clearly have detrimental effects on amphibians, a taxon in global decline and an important biological indicator for the health of the environment. 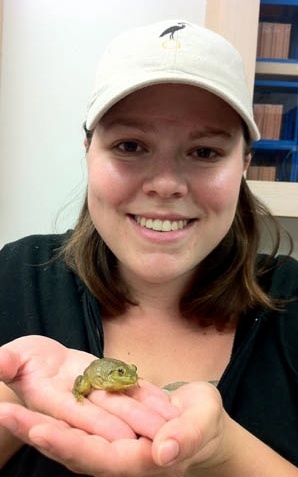 “We don’t quite know its role in amphibian declines, but when the expected environmental concentration is associated with nearly 100 percent mortality across four amphibian species, it’s a cause for concern,” said Rohr, an assistant professor in USF’s Department of Integrative Biology.